*Since the LTYM show, I’ve been going through things I’ve written that never made it into a blog or that might be able to serve some other purpose. I wrote this piece for a UT competition over a decade ago, and while it was not chosen, I still like to look at it because it is so nostalgic. You might enjoy it, too…especially if you are from Austin. bookstores, restaurants, vintage clothing stores, head shops and all other manner of vendors. Lamar passes over the Colorado River, where I sit on a bridge in traffic and watch steam rise off of Town Lake. Joggers pass by, and I can see the University rowing team at their morning practice. Often, after I have crossed the bridge, I am stopped in front of a railway bridge support decorated with memorial graffiti. I sit in my quiet car and stare out my window almost daily at a spray-painted red heart surrounded by green ivy that is captioned by the words, “Ivan Garth Johnson, Fair – Sailing Tall Boy, 1971-1989, Don’t Drink and Drive – You Might Kill Someone’s Kid”. Although I have been driving past these words for years, I have only recently noticed the tiny vase of flowers at the base of the support that is lovingly maintained. This always makes me sad, and I think of my own kid, a Fair – Sailing Tall Girl who is five years old and the love of my life. Sometimes I think of leaving this town, but I wonder, “Where would I go?” Where would I find this beautiful lake and these people who would spray-paint a bridge for so many years, never letting the memory fade in the minds of passersby? Four traffic lights later I am driving by what is probably one of the first-ever strip malls in Austin with room enough for maybe seven businesses. In this faded mall there is a space that currently houses a mediocre Chinese restaurant, but in my memory it is The Mariposa, The Butterfly: a natural, hippie food cafe where my mother worked when I was four years old. 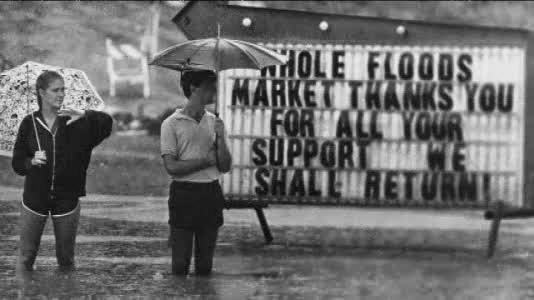 It is on Shoal Creek, which in my childhood, flooded almost every year. Shoal Creek parallels a fair length of Lamar, and although anyone who has lived in this town for a year or two can probably call up a memory of having seen it roiling just below the street, every few years it spills over its banks and rushes through the street like a liquid stampede. I remember being that little girl, my mother working at the Mariposa, and a great rain that produced a great flood that washed into the restaurant and took days to recede. We went there when it was sunny and the storm had passed, and my mom was drafted as part of the clean-up crew that was going to set things right. Sometimes you have memories that are real, and sometimes you have memories that are embellished, and I don’t know which this memory is, but it is very clear to me. Then, as now, there were always flyers in the restaurants that advertised band concerts and activist meetings, and all kinds of other causes asking for the involvement and passion of the public. I remember wading into the Mariposa in a pink dress, the water muddy and still, watching sodden fliers float upon the muck. Two blocks south there is a building that was the first-ever Whole Foods Market. When we went there in my childhood, it was just a funny smelling place where you could buy organic and bulk, with tiny aisles and lots of Birkenstocked feet. The high water marks are measured on the outside of the building in remembrance of the Great Floods. supernova explosion and its changing culture; it is me and I am it. My folks were divorced and remarried, and I split my months into two two-week intervals, each two weeks spent at a different house. My dad lived in the country then. It has since grown into a thriving suburb of long-time residents fighting for quiet and life apart from the city they moved away from, and new residents of new developments fighting for Wal-Mart and Starbucks. When I was at his house, he drove me into town for school. My mom lived in South Austin. I went to Zilker Elementary School, in the Zilker neighborhood, near Zilker Park, and from her house, I walked to school every day. Back then, it was just a nice old neighborhood where we could play outside and ride bikes and all of the kids knew each other. You could pick up pecans, when they were in season, from the profusion of old trees lining almost every street. Now it’s a chichi neighborhood where the houses are old, bafflingly high-dollar, and there is some weird affluence attached to the area. Oddly, the first thought that comes to me when I consider the inflated home prices is how much gigantic roaches love pecan trees and old houses. My best friend in elementary school was Kittredge Marie. We met in the fourth grade, and it was love at first sight. Every now and then you meet somebody that you recognize on the spot, like all your life you’ve been waiting for that moment. Kitt was one of those people. We hit it off instantly. She was the shy one and I was the loud one, and we’ve followed each other around ever since. One day she found an article in the Austin-American Statesman about witches. They had interviewed a witch who lived on Hether Street, which was smack dab in the middle of the neighborhood between our houses (she lived at one end of the neighborhood and I lived at the other), and directly across from the elementary school. We were so fascinated by the idea of her that that was the day we knew what we wanted to be when we grew up. A couple of miles down Lamar, which the Zilker neighborhood flanked, a new shopping center had opened. There was a Chinese restaurant, which is there to this day, and a New Age bookstore that relocated after several years. We could walk from either house to the bus stop on Lamar and ride down to the shopping center. There were a lot of days when we’d take the bus and go eat sesame chicken (before Kitt went vegetarian) and then sit in corner chairs at Book People and feed our brains with eccentric occult books. My interests at the time were witchcraft and tarot cards. I bought my first tarot deck there, and have been using the Connelly Deck ever since. I confessed much heartache there on the curb to my best friend, and I bought one of my best- loved books there, ‘Spiritual Midwifery’, which guided me through the earthquake of childbirth. Those days are long gone and we find ourselves mothers, wives, and professionals in the world of business, with no time for Chinese lunches and witchery. What I want to be when I grow up has changed, evolved, and still is unclear. Maybe living in a town that can stimulate any interest and challenge any belief has made me voracious for experience in all aspects of life. Culturally, politically, spiritually and environmentally I am inundated with opportunity and sometimes I freeze with indecision. I’ve been to many places that seem far less dynamic, and that makes me blessed in my history and my present. I struggle with acceptance of the people who continue to move to my town, but this is precisely why they come and it’s not for me to begrudge them their Austin experience. For years I’ve said, “I have to get out!” There’s so much life and vibe out there that I’ve never felt. But the vibe here is changing, and that’s not always bad, so I put off serious consideration of leaving. My mom lived in West Texas for a long time, in a mountainous desert region that is enigmatic and enchanting. People go there and never come back (my mother didn’t come back for 15 years) and they call it “manana-land” because everyone puts off coming home until tomorrow. That’s what Austin is for me–I’ve never been lost here, and here is where I’ve found everything that I am. Underlying frustration I feel from working hard and raising a child and wondering, “What great thing will I do?” is a peace that comes from my river and trees, from a Fair-Sailing Tall Boy, and cleansing floods that are not just memory, but deeply-felt history. In a sense, I am born of her body and in love with her spirit.